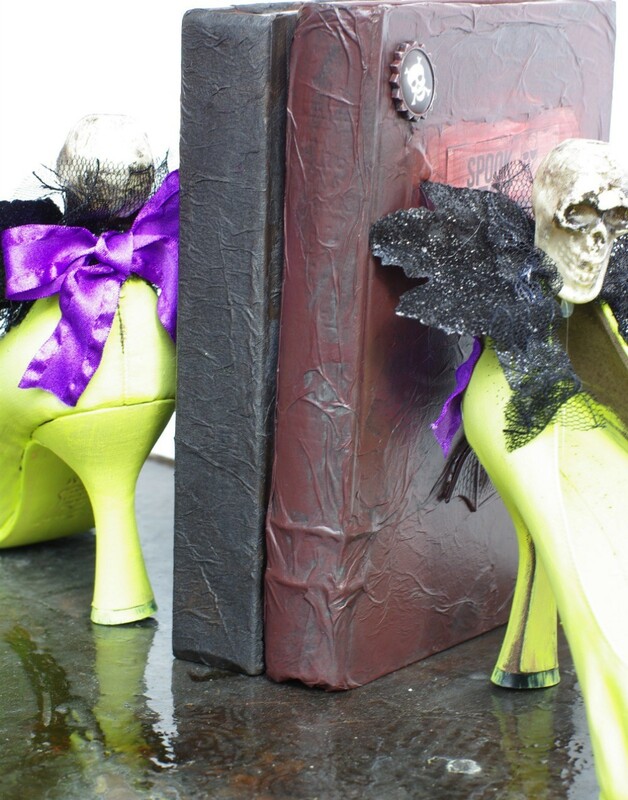 I decided this year it was all about putting on a pair of “witchy shoes” . . .
It’s really quite amazing what one pair of fun shoes can do for a gal, changing you into a whole different person for a few hours. 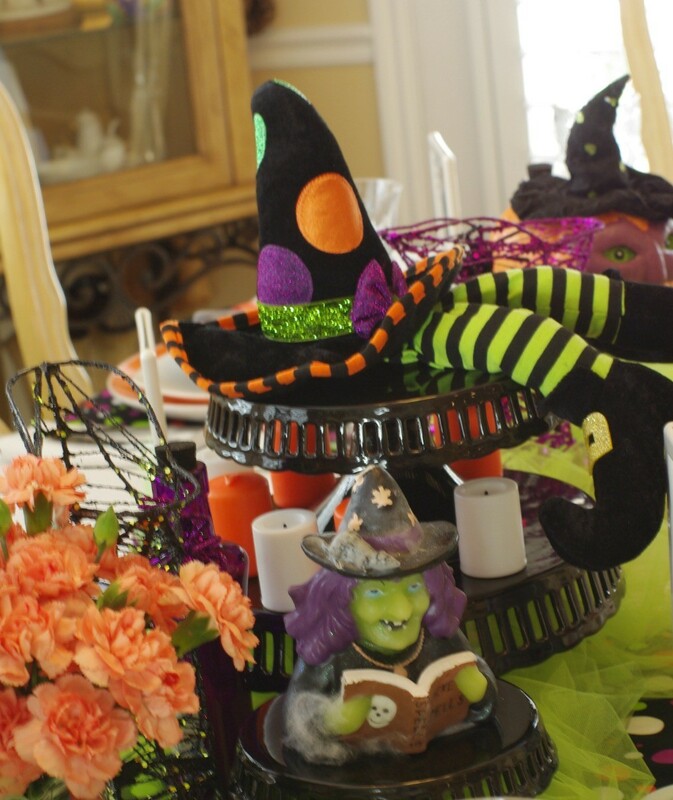 And for me, sparking this year’s theme for my annual witches tea party. 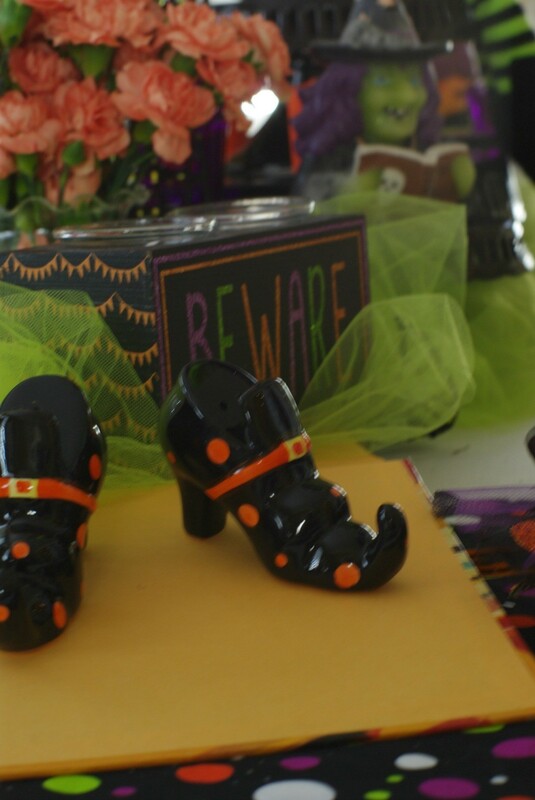 And then began my collecting and decorating around this theme. I decided to go kind of whimsical and fun this year . . . 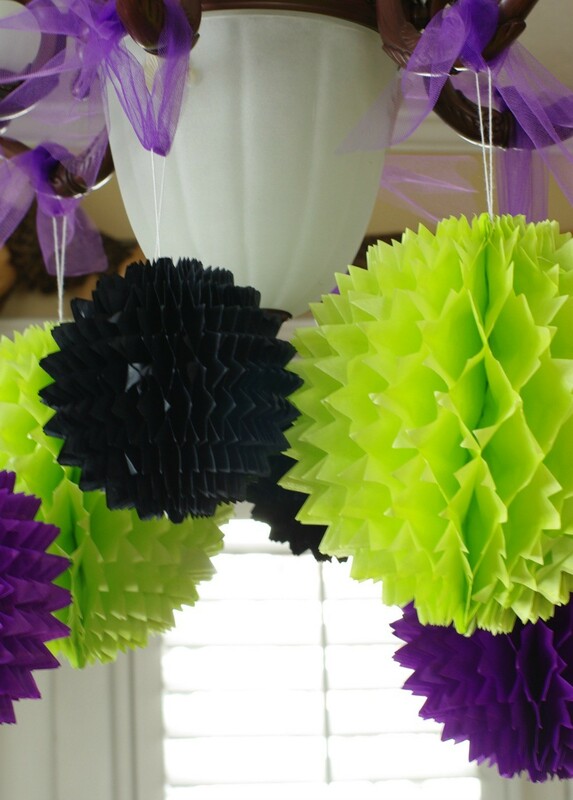 Focusing my color scheme to orange, purple, green, and of course a little black. I found the perfect material and made table runners as placemats. Which matches perfectly with my orange and purple dinner plates. 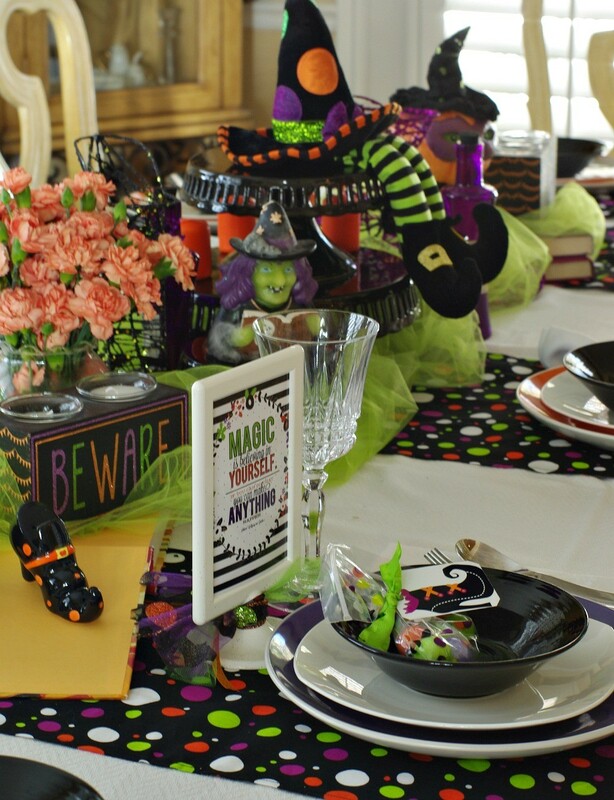 I mixed every other place setting with either orange or purple dinner plates and then layered on a white salad plate and black soup bowls. 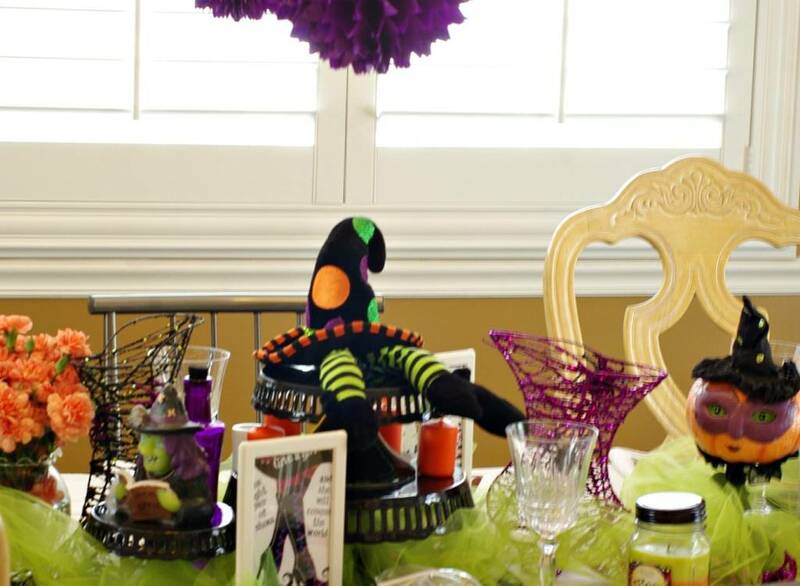 I just played around with the table scape collecting items which kept with the color scheme or shoes. It’s amazing what you can find when you choose a theme. Although I will put in a little note . . . I always think of my theme way in advance and begin collecting for a few months and using items from previous years. 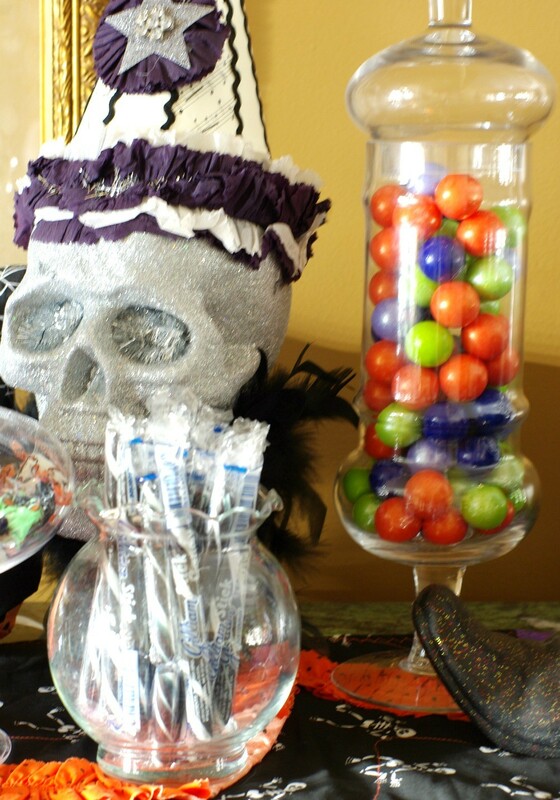 As I played with the theme I decided the big halloween colored gum balls matched perfectly and where so much fun so I filled little (matching polka dotted baggies) with gum balls and tied them up with a shoe tag which I placed in the soup bowls. 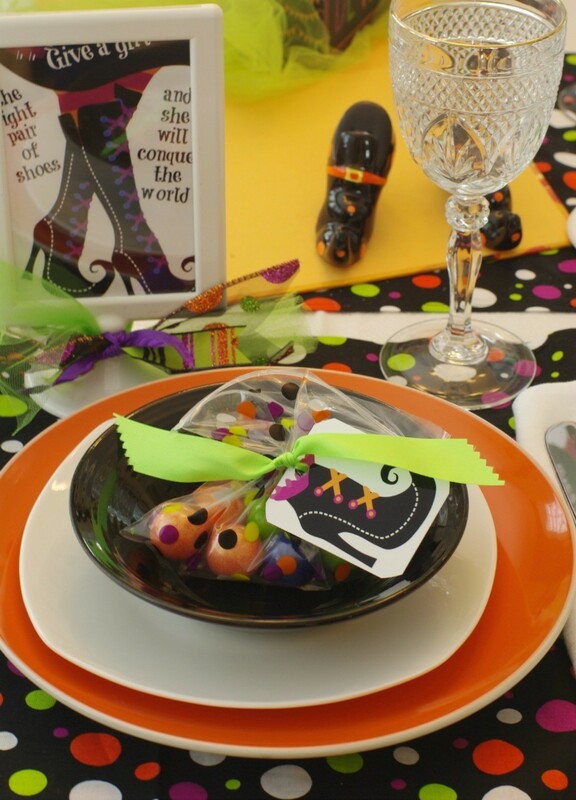 Each place setting also had a little picture frame tying in the theme of the shoes as well as a fun little message (color scheme) on the other side. And you know me, I couldn’t just leave them alone, of course they needed a junk bow added on. 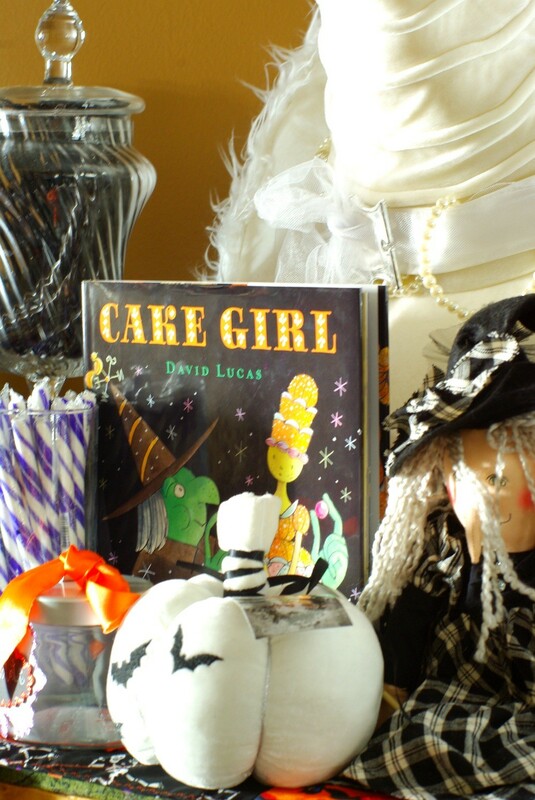 After the table was set I added little vignettes throughout the home to carry on the theme. 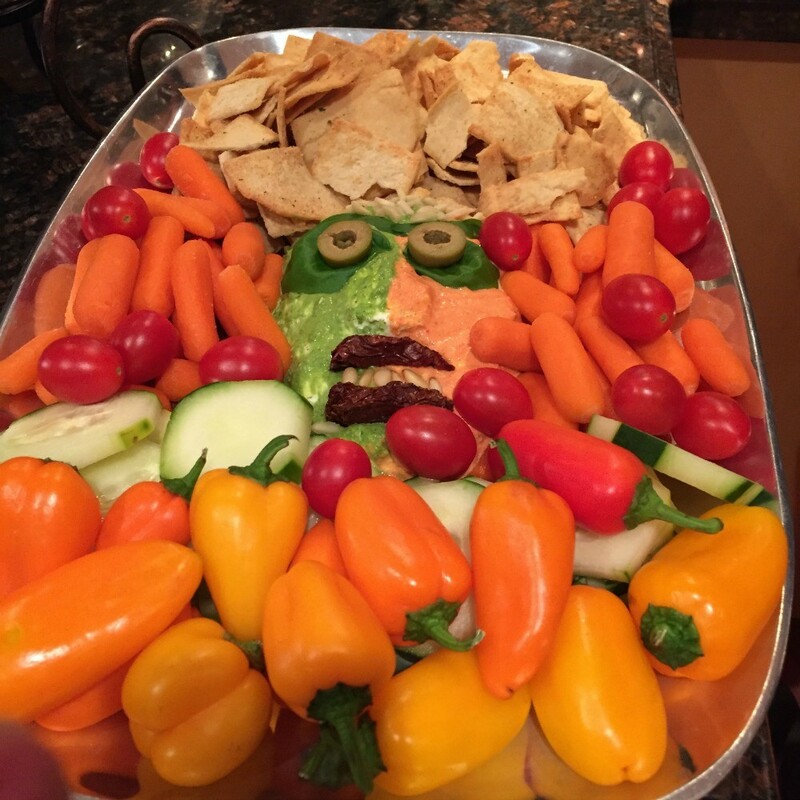 Even our appetizer island joined in. The treats all joined in as well. 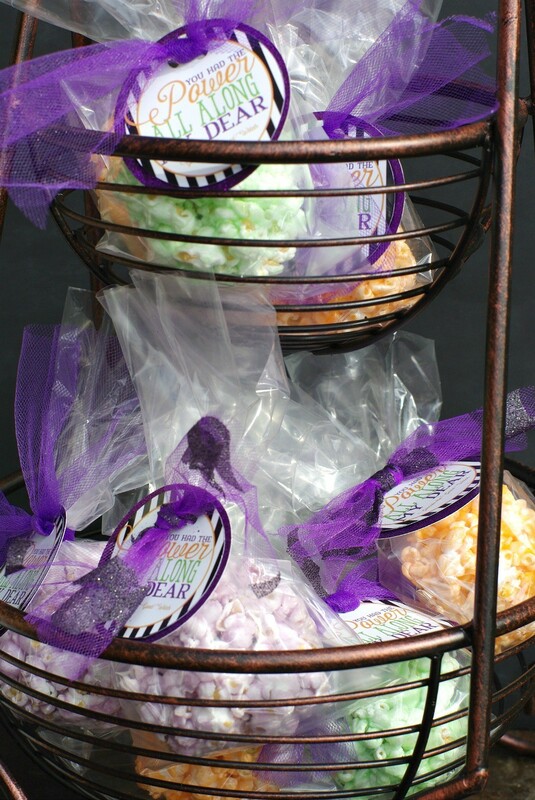 Colored popcorn balls with little tags . . .
Homemade chocolate (witches shoes) pretzel sticks . 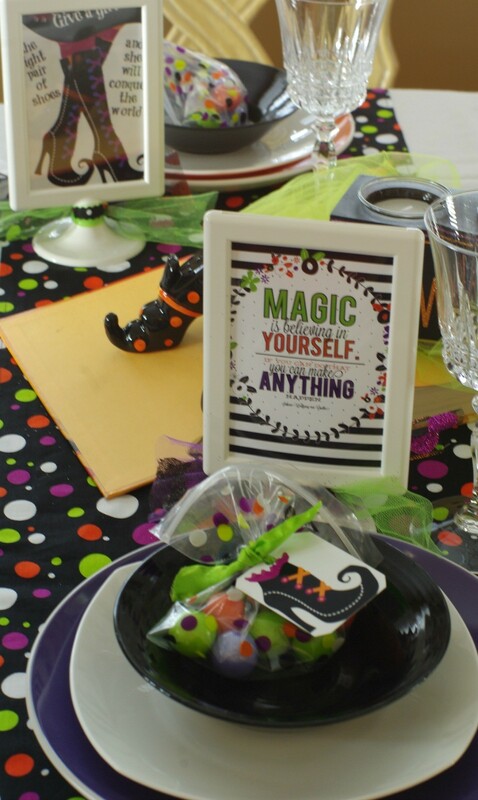 . .
As each guest would be leaving with her witchy treats, a fun themed gift bag was waiting to help them out. 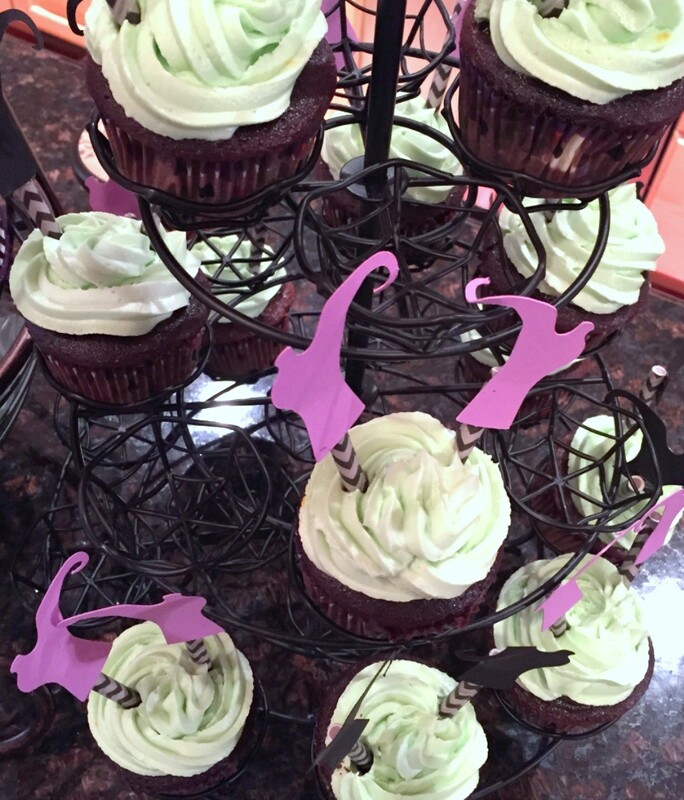 Thank you, ghoul friends for putting on those witchy shoes and joining the fun for the evening. You know, it’s true what they say . 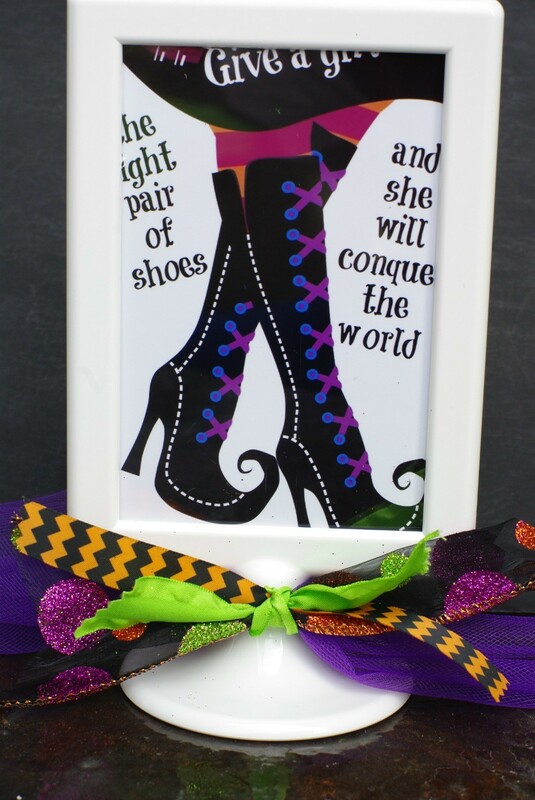 . .
“Give a woman the right pair of shoes and she can conquer the world”, at least for an hour or so . 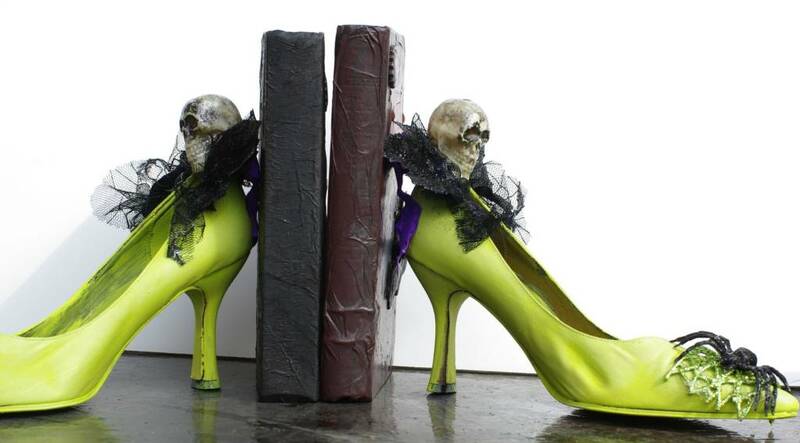 . .
*Huge thanks to Mckenna and Shelly Stoker for sending me my witches shoes . . .
You’re so welcome my cute friend. So good to hear from you. Again amazing. Such detail! 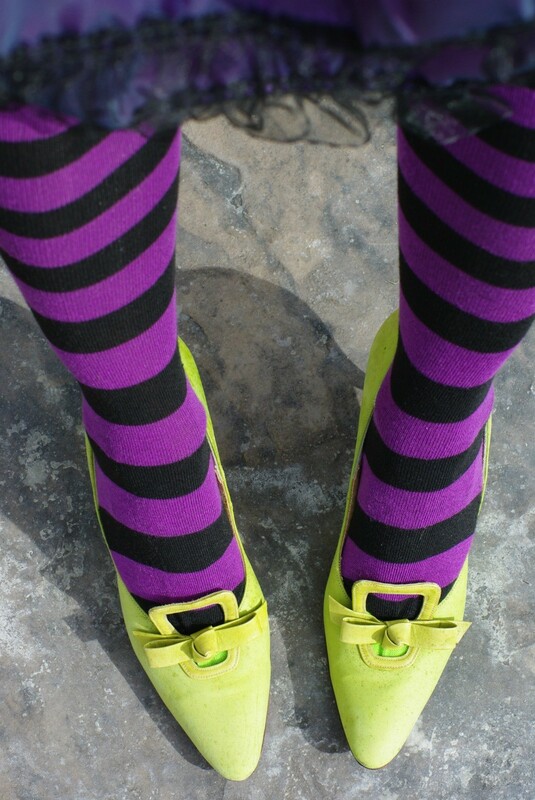 Love those tights with the green shoes (which, by the way, are very cute with different tights). Love the table, all the things you made (seriously?? 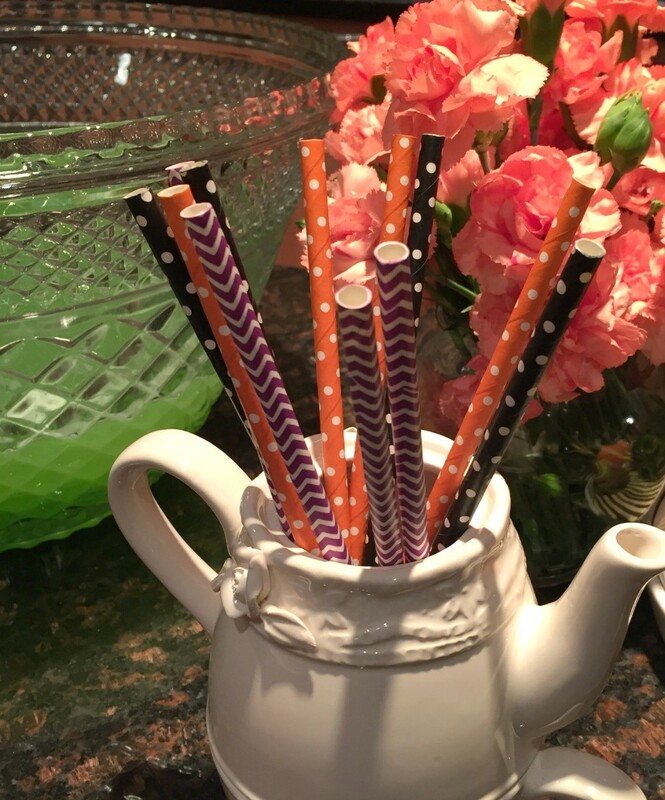 Chocolate pumps on a stick?). Do you always invite the same friends? Do they hold such lunches for you too? Might be a challenge to keep your figure. 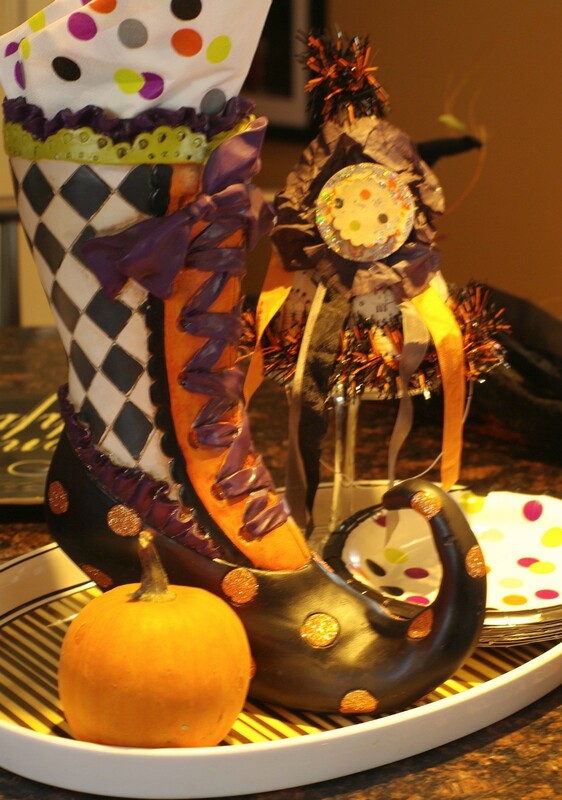 I kind of got carried away making fun treats, but those chocolate witches boots were a must. Yes, I usually invite the same group of close friends. Although if I tell you this you will really think I’m crazy, but a lot of times I will host two or three parties, including different group of wonderful friends. As for my beautiful sis, she is wearing really high heels but she is a good 3-4 inches taller than myself and she is a natural brunette with lots of natural curl. We really do have the same parents, haha. EXCELLENT party!!!! 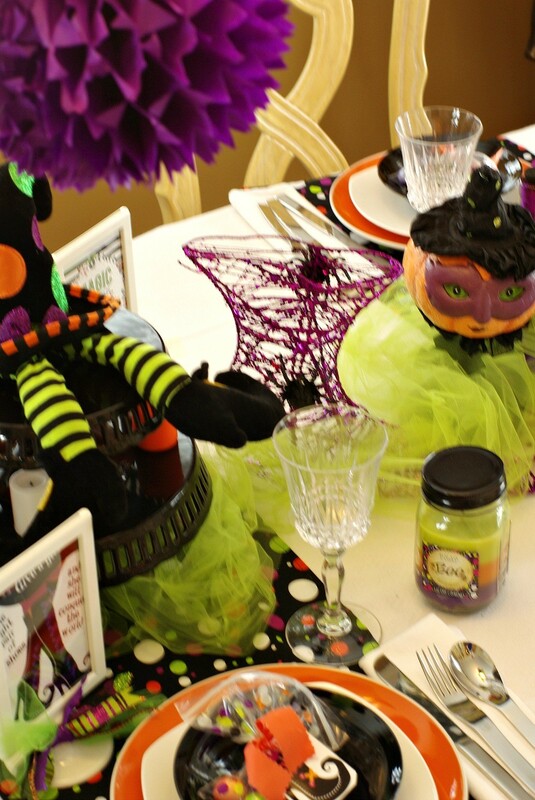 How can I ever pick a favourite theme party you have when you keep outdoing yourself? 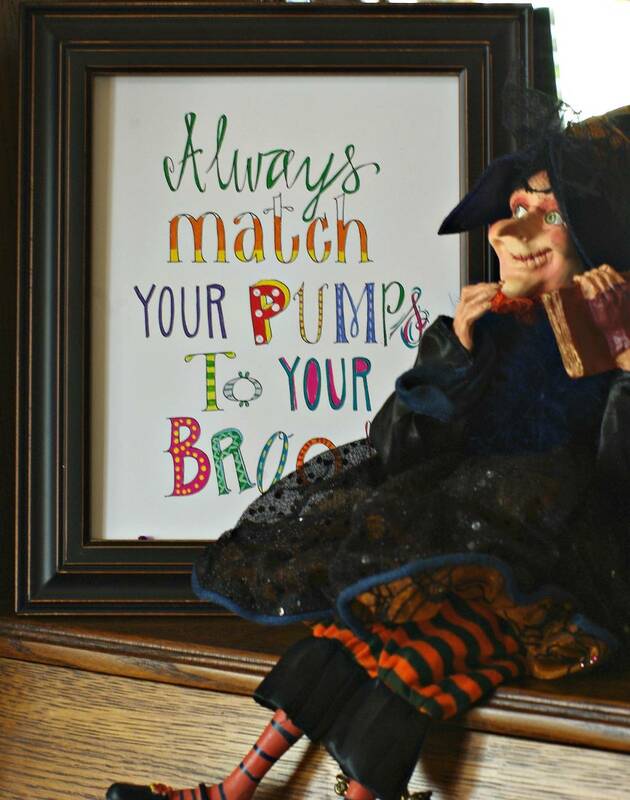 I love all the little touches you added, the veggie tray face, the witch’s shoe-matching advice, every single thing. And you all wore witch hats – too much much. I hope you paraded around town cackling afterwards. So true about shoes. 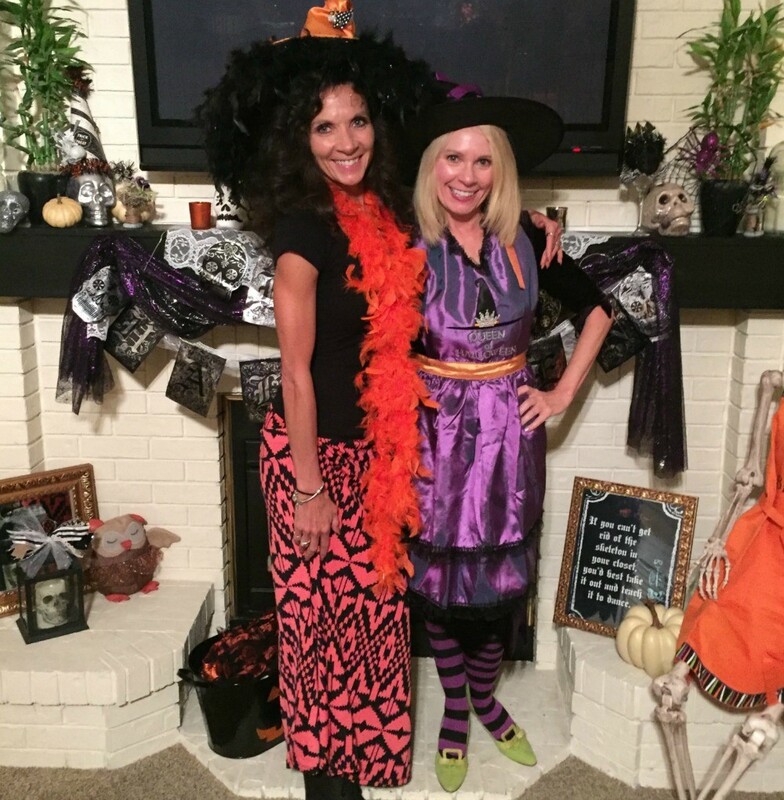 I bet you can fly in those shoes and your broom isn’t just for sweeping floors anymore! That’s a great shot of you with your sister. Of course we paraded around town, cackling up a tune! So amazing what comes out when you put on those hats, haha. Wow! Everything is perfect! Love your sub theme! It’s all magical! Thank you! And thanks for dropping by today. Thank you, Tina. I kind of love this crazy holiday also. What fun! Your shoes and outfit are PERFECT! 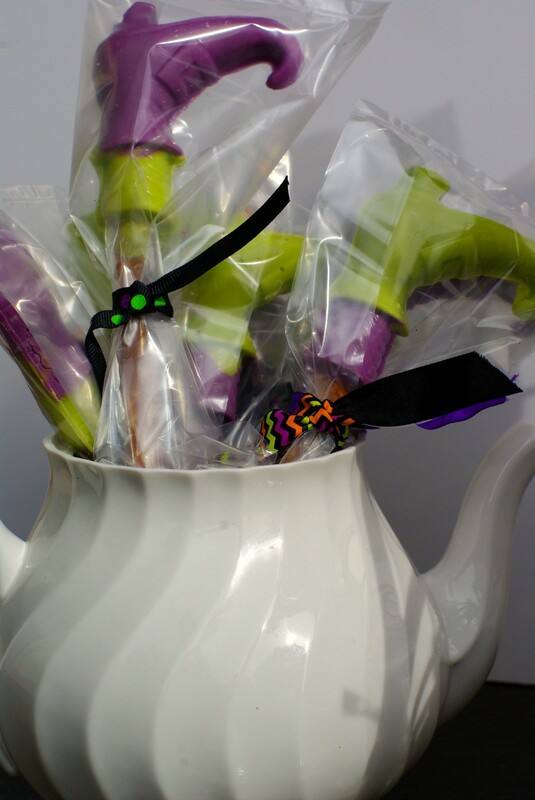 I must say I am extra impressed with the chocolate witches on pretzel sticks! Those must have been a pain to make! 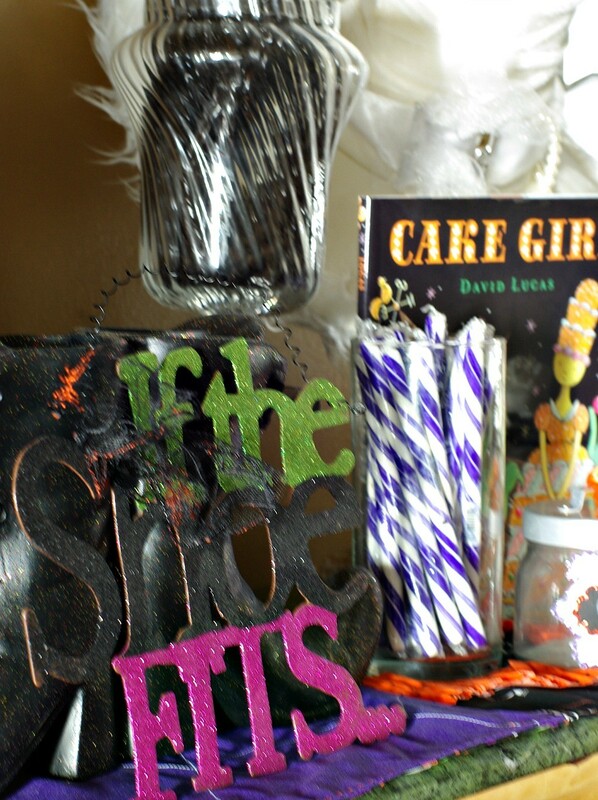 You are one dedicated party planner! I hope your friends know how lucky they are they get to attend these fabulous parties. Funny you and your sister really don’t look much alike. 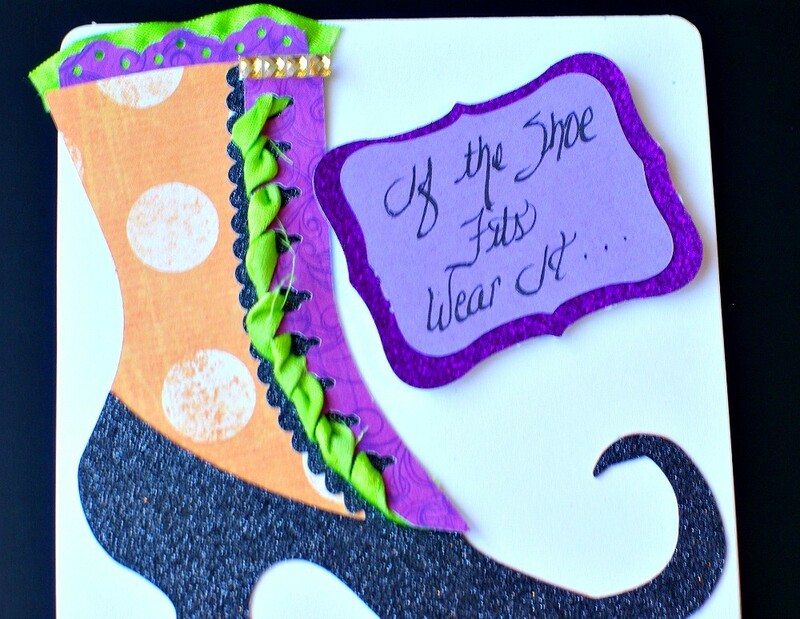 Trina – your parties are always so fab!! The attention to details is amazing. I am totally blown away at the way you put together this amazing party. Each detail is perfect and shows the artist in you. Again, I will say it..you make Martha Stewart looks so blasé. I adore these images and the creativity behind them. I loved the opening shot, and the green shoes as bookends, and everything in between. 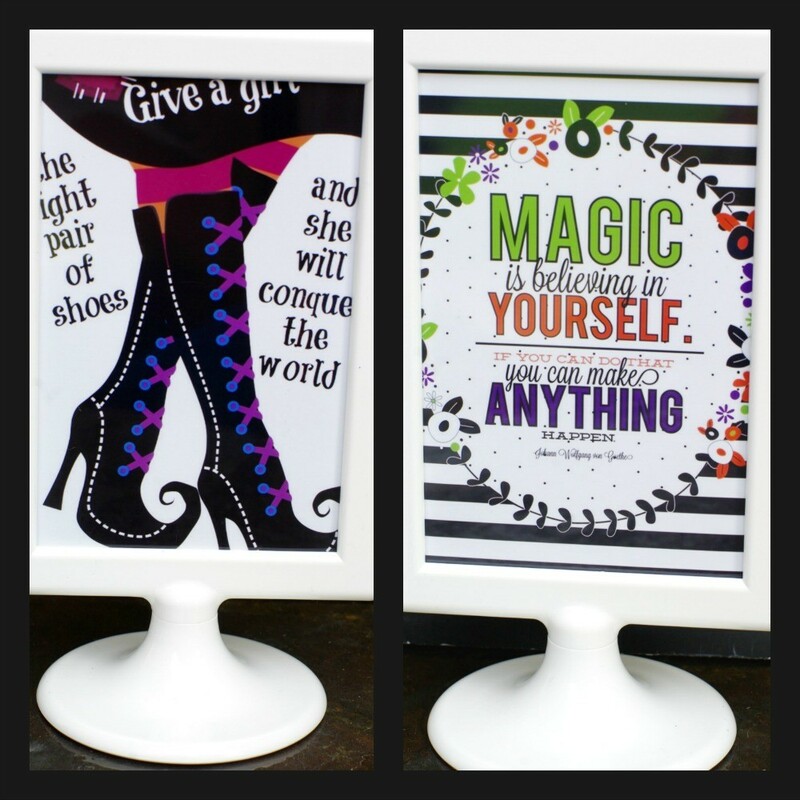 Frightfully clever, you beautiful witch , YOU! 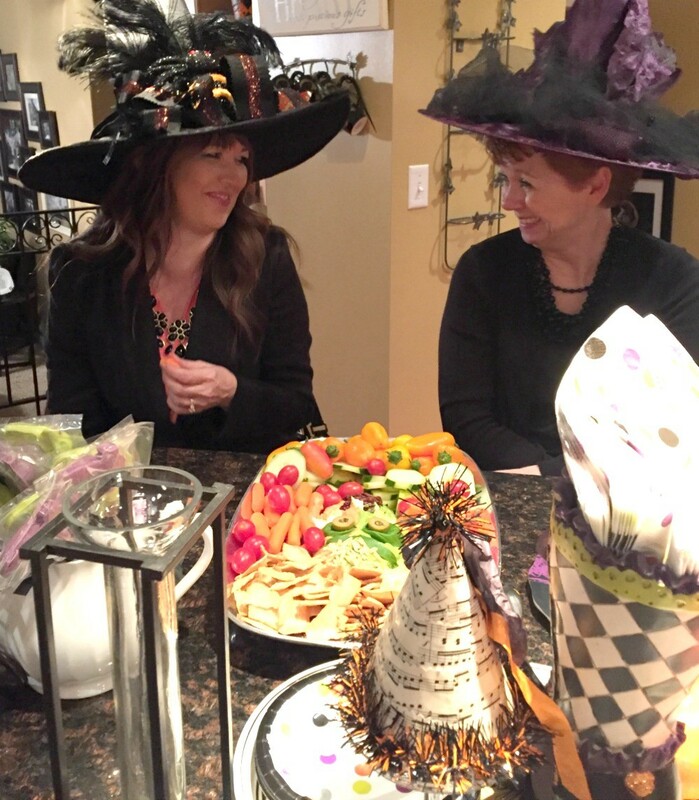 Well, how fun was this witchy tea? 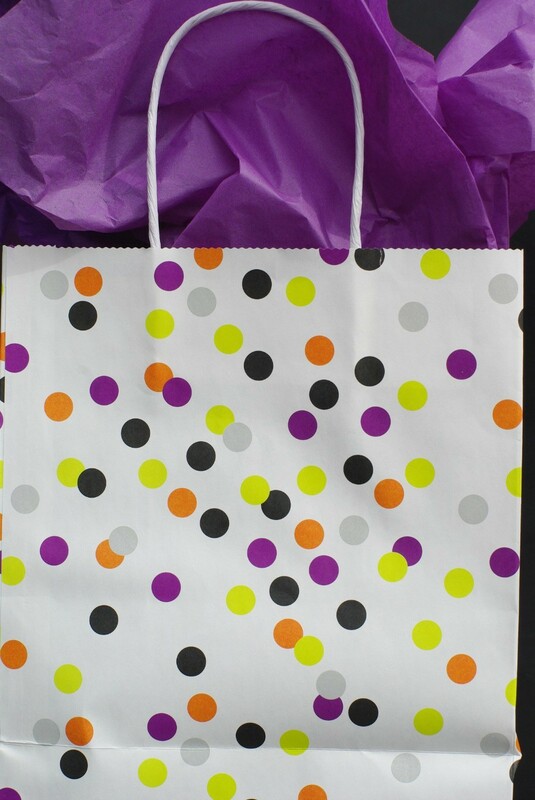 Love the polka dots and shoes theme! 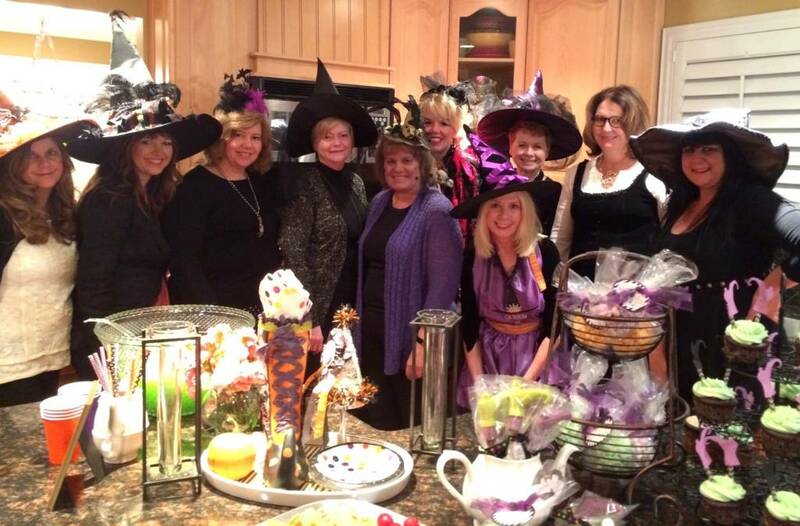 The witches all look like they are having ‘ fabulous time. You went all out, but that’s nothing new for you girlfriend! lol! Thanks for sharing with SYC. I will have the photo announcing ‘Creating Christmas’ on my SYC post tomorrow. Hop over and copy it and please add it to your side bar. Also, would love if you showed it in a post and encouraging people to put it on their blogs. Will do! Thanks for the heads up. I’ll start posting it weekly and on insta as well. 🙂 Oh, I love this theme! What a beautiful party all of you ladies had.